As soon as we decided to go to Haridwar there was one thing on our mind absolutely clearly... FOOD . 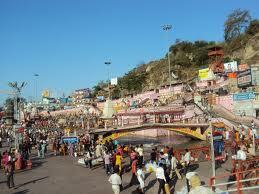 Haridwar is so refreshingly different from any other place when it comes to street food. Although you must know how to look out for the street vendors who serve good food and are hygiene conscious at the same time. Freshly prepared food must be the condition to even to have a look at it...don't ask me how to judge if the food is fresh . Another way to look out for a good street vendor is the beeline surrounding the stall...or thela or rehri as we call it here...we found one such thela selling kachori at the turn to Gau ghat (Gau is cow in hindi and sanskrit) around 8 AM . Two other kachori walas were standing like fools waiting for the customers to turn up and this Kashyap kachori bhandar was doing brisk business . We knew we had to wait patiently , so we walked around a bit and came back to see the fast dwindling heap of kachoris . Pawan Kashyap , the owner is a smart businessman . You can see him talking to a customer and doing his work at the same time... he judged that we were waiting and asked how many we need . I guess we are a bit shy people and just looked on seeing others being pushy around the thela ...We just wait patiently for our turn . Everywhere. Our faces must be telling this guy that we are dying to taste those yummy looking kachoris and yet can't yell our order . The best part is , the plates are made of fresh leaves and the cart is quite clean , you can see a dirty duster behind the donas but this is after everything has been finished... and the duster has worked hard .They collect the used donas in a bucket tucked under the cart . I liked the approach , keeping the surroundings clean and using environment friendly plates.. I made this kachori the next weekend at home , my low oil version , and it was lacking that crisp and crumbling texture but we liked the taste as my guess towards the spice mix was quite good. Paratahs at Hoshiarpuri are a refreshing change and we did a second round of breakfast that day just for the sake of it...One aloo paratha and one aloo pyaz ka paratha with a bowl of plain curds we shared .... heaven on my plate...The butter visible on the paratha is just smeared after tandoor baking...so it is light enough. The signboard says Hoshiarpuri hotel but it is actually a dhaba/restaurant . The service is good and tables clean . Good food makes up for everything else. Interestingly , this place gets a lot of guests in the dinner time and you are given waiting list number . The number is displayed on a digital screen just below this red signboard and people keep waiting till their turn comes. We waited for our turn this time too . Last time we had parathas there about 12 years ago and there was no apparent change we could notice .... how some places are timeless . There are so many things to eat and if you like fried food there are a lot of things you would want to explore . We found a nice chaat stall at the crossing of subzi mandi , didn't try the chaat as we were already full but the chaat vendor was being mobbed like a celebrity and we guessed it should have been great .... we have had chaats in Haridwar in our previous visits and it is always good . The things i would advise to ignore is the thandai the vendors on the upper road sell . Mishrambu is a much better choice if you haven't had thandai at Banaras. The chotiwala restaurant is just like any other place serving the usual suspects named makhni and shahi... Local flavors are not that tough to find when there is so much variety...go by your own instinct..
Beautiful post and lovely pictures. That Kachori must have been fabulous! Have not had these berries in decades. Gosh, this is torture! Loved the post and the description! The kachoris look absolutely mouth watering and so did the rabdi! Loved the quick recipe to make mulberry sauce. But I enjoyed paranthas in Paranthe wali gali in Delhi 22 years ago, this parantha also looks absolutely, cruelly delicious. WOWOWOWWOWOWOW .. you do make sure that people likeme drool over food and then curse why we came to uk :(..
Sangeeta, My mouth is watering at those kachoris!! Looks like you had a wonderful trip--I was wondering where you had disappeared! Also, the parathas at parathawali gali are over hyped IMO, they don't taste anything like parathas! Wow very tempting food. This also brought back memories of my visit to Haridwar. loved this post :) makes me want to be your travel companion sometime in the future ;) eating my way through the streets... love the yummy food pics. @ Rajani ..okay then...we'll go together whenever you come to India . Looks delicious, makes me want to visit Haridwar myself! Btw they burn the incense to keep flies and other bugs away. I am from Pune but my home town is haridwar, I Visit after every 2-3 years, One more thing of haridwar is famous which you missed is Chole (sukhe (dry)). This guy use to sell chole in Moti bazzar but since couple of years I have not seen him. I still am ready to pay Rs. 1000 for a single plate it was so delicious. Hi Mohan...i wish i could get hold of that chhole too. Some simple food can be so delicious it remains in your memory for ever..i can so understand....reminded me of some of my own old favorites. Yes it's still in Shimla and upper areas of shimla...I miss it too.